Our Inventor 2011 Training will help you discover the important features of this release of Autodesk's Inventor software, as the instructor takes you step-by-step through more than 310 individual lessons, spanning over 22 hours of video based training. You'll be able to work with assemblies, create and edit parts, increase productivity with advanced techniques and much more. GIMIT Learning Center's Autodesk Inventor 2011 Training will show you how Inventor 2011 redefines "ease-of-use," with a revolutionary new design experience that features new methods for modeling parts and assemblies. Our training course will show you how the manipulation part of modeling offers an uninterrupted design workflow. You will learn to control all command inputs right at the point where you are directly affecting geometry. How Dynamic Input in the Sketch Environment enables you to sketch more freely and directly. 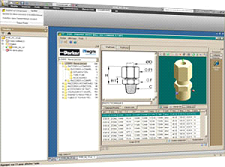 How the new Assemble tool enables you to "snap" components together quickly and accurately.